Your local news station might have a weatherman. It might have a weather woman. Taiwan has weather girls—make that, Weather Girls. Their goal is to make those global forecasts in distant cities exciting. Sometimes they dance around, sometimes they smile, and sometimes they ask you what your plans are. And sometimes they do this dressed as rabbits. "My favorite part about being a Weather Girl is definitely the cute outfits we get to wear," Weather Girl NueNue recently told Kotaku. "How many people get the chance to try on all these different outfits?" Weather Girls are the brain child of Next Media, the Taiwanese TV network famous for creating Sims-like news recreations. The Weather Girls first started in Aug. 2010, and currently appear on Next Media's news broadcast in Taiwan during the afternoon, evening, and late news. Since then, there's been about two dozen weather girls, usually with seven (sometimes more) each month, each for a day of the week. The girls use their Weather Girl status as a spring board for popularity, like any other modeling or TV gig. On television, the Weather Girls do their Weather Girl thing in Chinese. Online, however, the girls give the news in English or even Japanese, with the English-language version featuring American cities and the Japanese-language one featuring Japanese ones. In the above gallery, NueNue does her Weather Girl presentation for Japan. There's more preening here than in-depth forecasting. "I guess we all learn about it a bit in school right?" said NueNue. "Though I still don't know too much about weather forecasting." And the Weather Girls are quick to point out that they are not meteorologists. Their job is to keep eyes glued on TV sets, while the world temperatures scroll by. "At first I thought, 'How do you make weather fun?' It's just a lot of numbers." Other news stations might use stock footage of beaches or simple country maps, turning the global weather forecast into a bathroom break or a quick channel change. Next Media is not "other stations". The Taiwanese broadcaster specializes in turning the traditional way news is reported on its ear. In November 2009, golfer Tiger Woods&apos; life changed forever. So did TV news in Taiwan. According to Nue Nue, whose favorite season is spring, she was initially hesitant on how it would work. Said Nue Nue, "At first I thought, 'How do you make weather fun?' It's just a lot of numbers." Apparently, you make the weather fun by cosplaying every month. There's always a new theme. 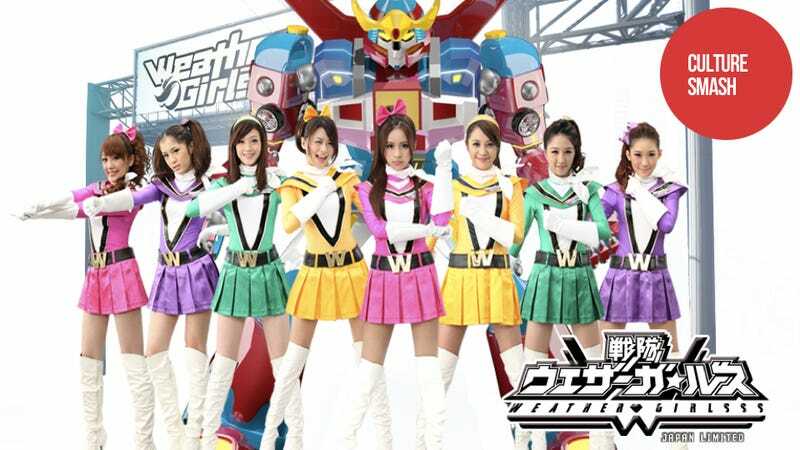 December's theme, for example, is super sentai (think Power Rangers). "I love this theme!" gushed Nue Nue, who is a yellow Weather ranger this month. "I get to play a superhero and help fight away my fans' daily blues." And since the global weather reports are just temperatures and basic forecasts like cloudy, sunny, or rain, Next Media can avoid seeming to trivialize major storms or weather events. "Weather reports are usually dull because it's just someone telling you that it's going to be sunny or it's going to rain, etc," NueNue said. "I'm really happy that I can be part this and hope people enjoy it as much as we're enjoying making it."